The seas are rising, and climate scientists say they'll keep rising as the globe continues to warm, causing all sorts of problems along tens of thousands of miles of coastline around the world. What the scientists can't say for sure, though, is how much sea levels will go up, or how fast. That's largely because nobody knows for sure how the vast ice sheets covering Greenland and Antarctica  especially the glaciers that flow down and into the sea  will respond. But that's changing, thanks largely to ice-watching satellites peering down from space. One of them has just reported in  and the news isn't encouraging. According to a new report in Nature, glaciers are getting thinner all around the perimeter of Greenland, and in western Antarctica as well. It's not so much that they're melting, says lead author Hamish Pritchard, of the British Antarctic Survey; it's that their seaward motion is accelerating. And, says Pritchard, "that's a much more rapid way of losing ice than through melting alone." Glaciologists already knew that Greenland has started shedding ice. "Back in the early 1990s," says Jay Zwally, a glaciologist with NASA's Goddard Space Flight Center, and the principal scientist for the agency's ICEsat orbiter, "Greenland was losing ice at the margins but gaining in the center. It was in balance." Recently, though, NASA's gravity-mapping satellite, known as GRACE, the Gravity Recovery and Climate Experiment, has shown a net loss of about a Lake Erie's worth of ice every two years. Part of it is probably due to melting alone, but scientists also knew as early as 1996 that some glaciers' motion had begun to speed up. One clear reason, says Zwally, was that summer meltwater was percolating down through cracks and lubricating the undersides of the glaciers, letting them slip more quickly down rocky slopes  a phenomenon known as the Zwally effect, since he's the one who first described it. But the new study, says Pritchard, using data from ICEsat, shows that there's more to it than slippery slopes. 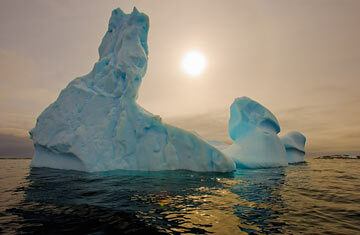 "We're seeing the same phenomenon in West Antarctica, he says, "where there's very little summer melt." What's happening instead, he and his colleagues believe, has to do with changes at the very mouth of the glaciers. When they reach the sea, many glaciers just keep going, reaching out beyond the shoreline to sit on the seafloor. But if warming temperatures or changes in ocean currents make these so-called ice tongues start to melt, they eventually float off the bottom  and the friction between ice and seafloor disappears. "It takes the brakes off," says Pritchard, "and the glacier accelerates." In Antarctica, where many glaciers flow, not directly into the sea but into giant, floating ice shelves, it's the thinning or total collapse of the shelves  something that's been happening with increasing frequency  that takes the brakes off. All of this has been seen before in limited areas; the difference here, says Pritchard, is that "we're saying it's happening in all sorts of areas simultaneously, and intensifying in certain regions." Indeed, the speedup isn't limited to the downstream ends of glaciers. "Once it starts, it propagates inland very rapidly  we see a wave of thinning. So even the high, cold and remote areas far from shore are feeling the effects." What Pritchard won't do, however, is predict how this new information will affect estimates of sea-level rise. "We don't do sea level because we don't have enough information. Will this lead to a runaway collapse of the ice sheets, or will it all grind to a halt? The honest answer is, nobody knows." Indeed, as recently as 2007, the Intergovernmental Panel on Climate Change (IPCC) declared in its last major report that its own projections of sea-level rise  between 7 in. (18 cm) and about 2 ft. (60 cm) by century's end  didn't take into account changes in ice-sheet behavior, because nobody really knew what to expect. Information gathered since then has already revised the conventional wisdom about rising seas upward to about 3 ft. (90 cm), and this week's study will undoubtedly figure into future calculations. There's still plenty to figure out, though  and ice experts, including Zwally, are already writing more papers based on ICEsat, GRACE and other observations. "We still really don't know much about ice-sheet dynamics," says Zwally. "But the glaciers are doing the experiments for us." Michael D. Lemonick is the senior science writer at Climate Central. Watch TIME's video "Consequences as Himalayan Glaciers Melt."